Purchase online TC426 High-Speed Power MOSFET Drivers in India at low price from DNA Technology, Nashik. The TC426/TC427/TC428 are dual CMOS high-speed drivers. A TTL/CMOS input voltage level is translated into a rail-to-rail output voltage level swing. The CMOS output is within 25 mV of ground or positive supply. The low-impedance, high-current driver outputs swing a 1000 pF load 18V in 30 nsec. The unique current and voltage drive qualities make the TC426/TC427/TC428 ideal power MOSFET drivers, line drivers, and DC-toDC converter building blocks. Input logic signals may equal the power supply voltage. Input current is a low 1 μA, making direct interface to CMOS/bipolar switch-mode power supply control ICs possible, as well as open-collector analog comparators Quiescent power supply current is 8 mA maximum. The TC426 requires 1/5 the current of the pin-compatible bipolar DS0026 device. This is important in DC-to-DC converter applications with power efficiency constraints and high-frequency switch-mode power supply applications. Quiescent current is typically 6 mA when driving a 1000 pF load 18V at 100 kHz. 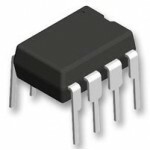 The inverting TC426 driver is pin-compatible with the bipolar DS0026 and MMH0026 devices. The TC427 is noninverting; the TC428 contains an inverting and noninverting driver. Other pin compatible driver families are the TC1426/ TC1427/TC1428, TC4426/TC4427/TC4428 and TC4426A/TC4427A/TC4428A.